In 2007, the Wooster Group undertook a sustained “emulation” of a 1964 “theatrofilm,” featuring Richard Burton and directed by John Gielgud, made possible by “the miracle of Electronovision,” one of several technological predecessors for recording performances on videotape. 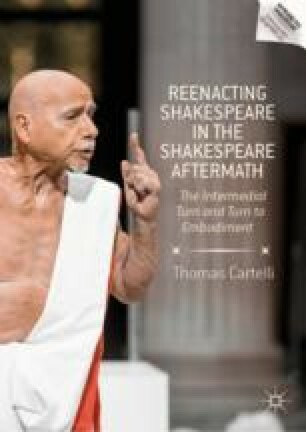 The Group’s simulating actors claim our attention with an intensity of address that exceeds whatever residual claim to immediacy the “distressed” filmed performers can make, turning Hamlet itself into a pre-scripted race to the finish. In its engagement with this project, the Group nonetheless managed to bring living bodies, ghosts of the past, and electronic media into interactive commerce on stage, performing a series of remediations that not only involved the representation of one medium in another but the integration of different media in the development of new theatrical forms.